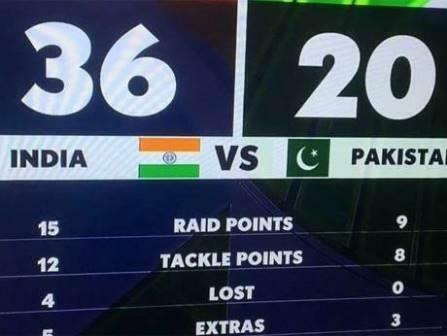 Dubai: India defeated Pakistan 36-20 in the opening match of the Kabaddi Masters Dubai six-nation tournament opener at the Al Wasl Sports Club. Shaikh Nahyan Bin Mubarak Al Nahyan, UAE Minister of Tolerance, inaugurated the event. The toss was conducted by Bollywood star Abhishek Bachchan, who is also owner of Jaipur Pink Panthers in India's Pro Kabaddi League. Among the dignitaries were David Richardson, CEO of the International Cricket Council. This nine day tournament is being contested by India, Pakistan, Republic of Korea, Iran, Argentina and Kenya.